The Kansas Institute of Underground Technology evolved from the increasing need of a trained workforce in the career fields of horizontal direction drilling and training for locating underground utilities. North Central Kansas Technical College is a leader in the delivery of technical education within the State of Kansas. In conjunction with grant assistance from the Kansas Department of Commerce and support from Charles Machine Works/Ditch Witch, Inc., has developed the Kansas Institute of Underground Technology. The Institute that is commonly referred to as U-Tech, features a state-of-the-art up-to-date curriculum, along with hands-on practical training opportunities to allow participants/students the opportunity to successfully complete the training needed to safely operate equipment used in underground technology. As President of North Central Kansas Technical College, I invite you to scroll through our web site or give us a call to learn more about training opportunities. The growth in construction and telecommunications throughout America has led to an increased need to bury fiber optics, electrical lines, water pipes, sewer lines, etc. Moreover, the use of a backhoe loader isn’t always practical, feasible or economical, due to existing hazards or terrain. That leaves directional drilling as the best option and the fastest-growing industrial talent among utilities, municipalities, contractors and the communications industry. Designed as a course delivered over a four-to-five day format, the Horizontal Directional Drilling Level I Training Course is the first of its kind in the nation. Through a combination of class-room and field training sessions, participants will acquire the useful knowledge and skills required for operating a directional drill according to the standards included in the manufacturer’s Operator’s Manual and the Best Practices Guide developed by the AEM and HDD Consortium. The overall objective of this training is to provide participants with useful information and the opportunity to develop skills for operating equipment. Explain proper procedures required in the event of an electric strike and gas strike. State the proper method of verifying a specific “locate” that will be crossed along the planned bore path. Demonstrate the proper procedure for calibrating the Tracker to the beacon. Demonstrate the ability to set up the directional unit according to the instructions in the Operator’s Manual. Identify bits and back-reamers used with applicable soil conditions and job specifications. Demonstrate the ability to locate and take a depth estimate of the beacon. Demonstrate the ability to operate the directional drill unit according to instructions in the Operator’s Manual. and transmitter system according to the standards included in the manufacturer’s Operator’s Manual and the Best Practices Guide developed by the Common Ground Alliance. The overall purpose for this course is to provide the participant the skills and knowledge to accurately locate and identify underground utilities and obstructions. This course is designed to equip participants with knowledge and skill development for basic operation of advanced pipe and cable locating equipment. Demonstrate the ability to properly connect the transmitter to target line. Demonstrate the ability to locate and take a depth estimate of a target line. Demonstrate the ability to change transmitting frequencies of the transmitter and match it with the 950 Receiver. If our standard training, in Horizontal Directional Drilling or Locator Operations is not what you are looking for we can develop a customized program to meet your needs. 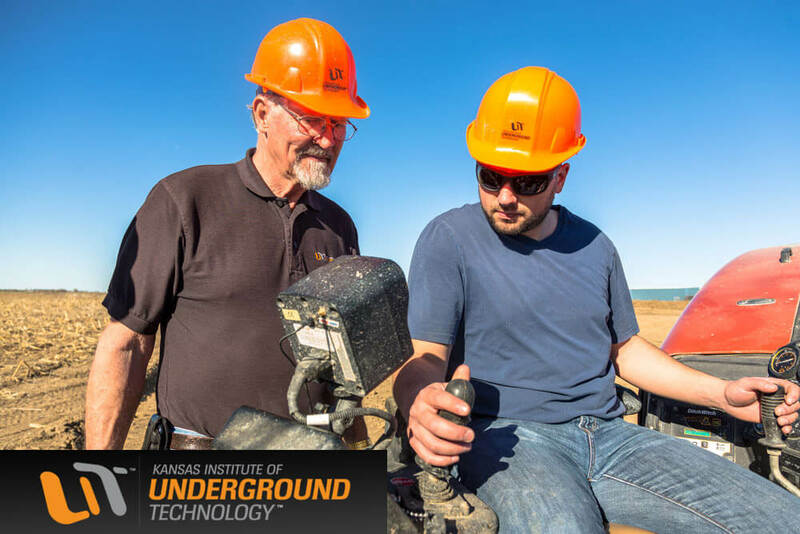 The Kansas Institute of Underground Technology can design training that best fits your workforce whether it’s face-to-face, or online or webinar. Since our training is mobile, we also have the ability to train at a location of your choosing. We invite you to look at the Damage Prevention Concepts Agenda, which is just one example of a company designed training. Contact us and let the Kansas Institute of Underground Technology build the customized training that best suits you. Got a question regarding the Underground Technology program?